I’ve been messing about in the kitchen experimenting with some recipes. Our chickens have been poorly, and all but one has stopped laying eggs. Being unwilling to buy eggs I decided upon an eggless sponge. Egg-free recipes aren’t just handy when your hens have stopped laying though, as anyone with an egg allergy will tell you! This apple cake recipe one began as a plain sponge cupcake recipe. I opened the cupboards pondering what I could use as flavouring and found the old favourite – cinnamon. And what goes well with cinnamon but a good old apple or few. Today I wanted to try the recipe again, but I wanted to see how it went as a single, large cake. Slowly sift in flour, baking powder and cinnamon. Stir together well. Add water and stir thoroughly until all ingredients are combined. Stir chopped and diced apples into the mixture. Pour into a lined and greased 8 inch round springform cake tin. Bake for 45 mins. If you find the top is over-browning before it’s fully baked cover the top with tin foil. This will stop it getting burnt before it’s fully baked. Once baked remove from oven and place tin on a wire rack to cool. Once cooled remove from tin and make frosting. 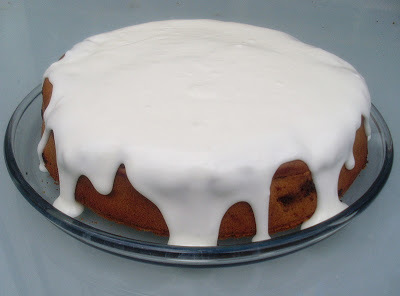 Whisk together the cream cheese and icing sugar until the mixture is thick and gloopy, but still pourable. Pour onto cooled cake. Watch as it runs over the edge of the cake into rivers of deliciousness. Try not to drool over it. That’s not hygienic. Let it sit for at least an hour before serving. This is a good test of willpower. Oh that cake makes me want to chuck my diet out the window! thanks for visiting my blog the other day! zowie! that cake looks amazing!! yum! Seriously, ship that cake here! Or don't..no I couldn't just have a piece. I have no willpower at all! I need to have that cake with my cup of coffee right now!! Thanks for visiting my blog! My goodness. I just get done writing a post about ignoring my food temptations (AKA- cinnamon buns). Then I come over to your blog and find this yummy recipe. What's a girl to do? Thanks for stopping by. Oh dear. Delish. And I'm on a diet. I can 'smell' it just looking at the pictures. that looks so good:) i'm going to have to give it a try! & thanks for visiting today. That cake looks amazingly yummy! I might have to try it. I can't believe it doesn't have eggs in it. You're making me a hungry little duckie. I'll e-mail you a pink plate for a slice, ok? Thanks for stopping by my Blog for a visit! Your cake looks sooooo delish! I would try to make one, but you lost me when the recipe didn't start with…1 box of….! I've never made a cake from scratch, with you know, flour and stuff! Oh this looks WONDERFUL! Bless you—my kids are allergic to eggs! I will definitely bake this! Thanks for the SITSa comment at my blog today–stop in any time. Thanks for stopping by my blog today! I truly appreciate your comment. wow I am so making this. Welcome to SITS! We are excited to have you! That icing is making me hungry.. it looks soooo good! Be warned, the cake is very moreish. I kept picking away at it, then still going back for just another tiny bit. If I don't lose any weight this week you'll know why!